LOVE this faucet!! Great with our Farmhouse sink!! The black is very neat and goes perfectly with my gray/black/white/yellow color scheme! This faucet looks and performs like those priced much higher. LOVE it!!! I love the reach that the hose has, water pressure is excellent , and husband said it was easier to install than our previous faucet- with better designed connections. I recommend this product. Upon arrival the packinging was fantastic. Foam wrapped and in plastic to boot. No chance it will arrive damaged. From inspection of the box two things became apparent. 1, their is no cover plate. Most kitchen sinks will have 3 if not 4 holes. Every sink at *** comes with the cover plate. This one did not. Not a huge deal, *** sells caps for each individual holes in stainless for about 3 bucks a piece. 2, no soap dispenser. Blame that on my poor research I guess. INSTALLATION: don't even read the directions. Basically useless. Simple install though, assuming the water hook ups provided were of proper length. Maybe I just have abnormally tall countertops? Had to go to the hardware store and purchase extensions so I could hook it up. About 12 bucks. FUNCTION: works great. Water pressure is good. Additionally I like the design with the coil. It's separate of the nozzle at the end so you can extend it like you would a separate spray nozzle. No other coil industrial faucet is like this.the coil is built in to the spray nozzle at the end meaning you only have 3-5 inches of flex. The Vigo design is Great for dishwashing. Only negative is how unsturdy the faucet becomes by not having the cover plate. All the load is placed on the single mount. with a standard builders grade sink it will bow and flex. I can take the faucet and move the entire unit 1 to 2 inches forward or backwards. It also weighs down on the front and it leans forward. Picture provided shows this. OVERALL: good unit. Great value and good function. Can't beat it for the price. Total investment is approx *** . If I want the soap dispenser they offer one for *** dollars. *** sells name brand for *** . Is the *** dollars extra investment worth a name brand? Maybe. Do I regret the purchase? No, I don't. Just perfect! Ordered this and the coordinating soap dispenser for my kitchen remodel. I wanted to do something a little different and replaced all the stainless steel with matte black. I love how it turned out. This not only looks great but functions well. I love the pull down spout and how easily you can switch between spray and streaming the water. Highly recommend! Kitchen reno almost complete! We love this faucet! The product is true to description and the matte black finish is amazing! The pull-down spray head extends a good distance and adds to the overall usability of the faucet. 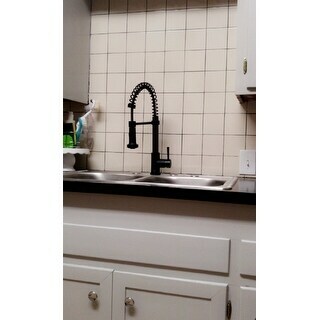 bought this VIGO matte black pull down spray kitchen faucet to accompany my klaus black onyx undermount sink. it is streamlined and sturdy. it creates a fantastic industrial look. I was looking for a black faucet and this one is perfect. the fact that it's matte makes it ver modern, the design is clean and industrial. just what i was looking for. 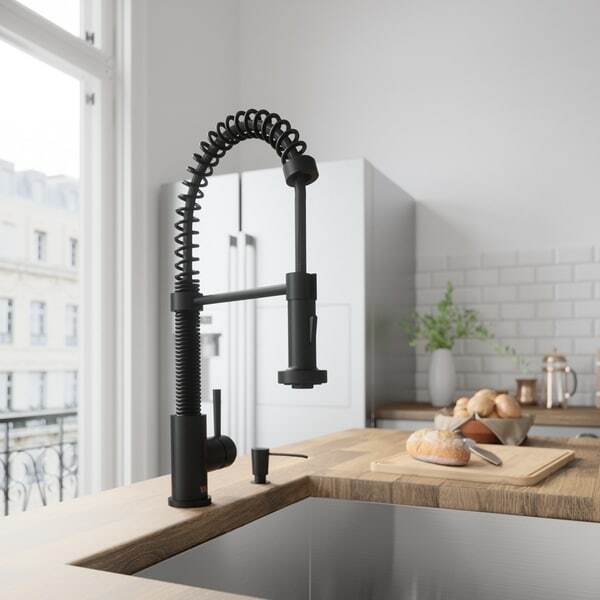 We love the Matte Black Pull-Down Spray Kitchen Faucet, it looks amazing in person. It is made out of high quality materials, and was more heavy duty than we expected. Would highly recommend. DEFECTIVE VIGO Edison Matte Black Single Handle Pull-Down Spray Kitchen Faucet I ordered this faucet from Overstock.com. 1. Plumber installed it and it leaked from a location within the metal housing, which is inaccessible. 2. I called Overstock.com to let it know, fully expecting an easy exchange. Nope! 3. Overstock.com told me I had to contact the manufacturer (Vigo), even though I bought it from Overstock.com. 4. I called Vigo, talked with Carlton (a Supervisor) and told him what my plumber discovered and requested an exchange. 5. Carlton said (and I quote) "under no circumstances will we just send out a new faucet", that Vigo does not just” take customer's word for it”. Rather, Carlton told me that I had to uninstall the faucet and troubleshoot it per Vigo's instructions. (Say what?) And, if it still leaks a replacement would be sent. 6. I told my plumber the above and he called Carlton in hopes of getting an exchange, but Carlton repeated the no exchange/customer’s word no good policies and insisted that the faucet be troubleshooted. 7. Plumber troubleshoots and re-installs the faucet and it still leaks from a pin hole in the copper line under the metal housing. 8. I called Carlton and he repeated the no exchange/customer’s (or even plumber’s) word no good policies. Rather, Carlton will send me a "cartridge" so that I can try to fix it again. 9. I said heck no, I'm sick of fixing your product. I already jumped through the hoop you said would be the only one. Replace it. Carlton refused, repeated the no exchange/customer’s word no good policies, insisted that I install the new “cartridge” he will send me. Again, I said no way. 10. Carlton then suggested that I take the faucet apart again and take video the source of the leak (like my android camera can clearly zoom in on a pin hole) because, as he told me before, customer’s word no good, Vigo’s warranty department requires proof. 11. So, I took this video. I doubt Carlton/Vigo will accept this as proof and will insist I try to fix the faucet again my installing a new cartridge, but we shall see. 12. Next morning...B***, Product Support Specialist, from Vigo now asks me for my sales receipt and tells me that it is the cartridge that is bad, that I have to replace it. Personally, I’ll never buy Vigo product again (and I’ll think twice about buying anything like this from Overstock.com again) considering its defective product and astoundingly poor service, but maybe you'll have better luck! 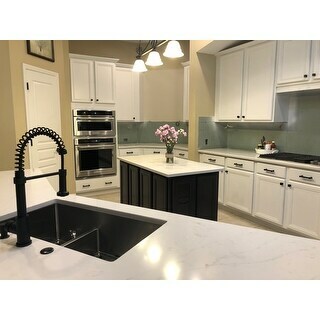 Perfect matte black for my modern farmhouse new construction great price love this faucet for the kitchen highly recommended!! It looks exactly like the picture. It's exactly the style I was looking for so I'm really pleased with this purchase - especially for the price. Great value. The only reason I didn't give it 5 stars is that the water pressure isn't very strong except when you're using the sprayer (which is super strong). Maybe that's my plumbing or how it was installed but I thought it odd that one setting is dramatically different from the other. I haven't experienced that with previous faucets. Overall I would definitely recommend it though. A vision of beauty ! 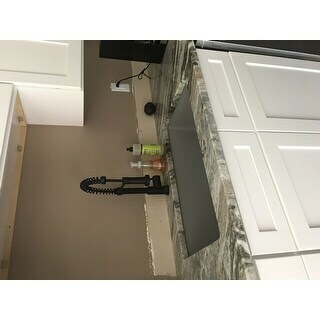 I just remodeled my kitchen and bought a black composite sink to go under the granite. I needed a black faucet that wasn't shiny. I couldn't find one in the stores and took a chance ordering this online. It's perfection! I still can't believe the price. I would have paid double. It truly is beautiful. After 5 months of use the sprayer wouldn't work unless you pressed down on the sprayer. Got a hold of Overstock and they got me the manufacturer phone and an order# that was traceable. When I called Vigo they said it sounded like a faulty sprayer and sent another. Old one crewed right off and voila... The new one worked fine. I appreciated the fast, great response from both parties. I haven't seen too many black fixtures. When I saw this I had to get it because my sink is black with light colored countertops. It looks great and works awesomely!! I put the handle in the front, facing me at the sink and it's so easy to use. I would recommend this to everyone. It comes in different finishes, but this brand, which I never heard of before, is a great quality. I'm very happy with this purchase. Hard to find black faucet, nice quality and looks great! I love this faucet!! It's beautiful and the sprayer is strong! The only reason it is not a 5 star is that the angle of the bend is kind of sharp and the sprayer is closer to the edge of the sink rather than extending into the middle where I'd prefer it. Sometimes because of that, it sprays water over itself and the backsplash. I wish it were a wider arc. It’s very simple looking , works perfect & I love the features . Very happy with this purchase. I am happy with this faucet, we are using it at a bar sink and the larger version and the kitchen sink. I have used VIGO before in our previous home and lots of bang for the buck. Nicely packaged! Great price for the quality. Looks very stylish with matte black finish. It is a great purchase! "can anyone provide the size of hole required for installation"
The whole size required would be 1 ¾. Please feel free to reach out with any additional concerns. "can you tell me the diameter of the hole required for installation...i am waiting on delivery but need to install granite before it arrives"
The hole diameter is 1 3/8 inches. "Why can this product expose you to lead?" It cannot expose you to lead. It will include a certificate indicating so. "Does VIGO Matte Black Finish Escutcheon plate fit this?" yes the deck plate matches and fits the faucet. Great combination! This is made of solid brass. "Does the finish scratch or come off?" We have been using this in our kitchen for almost 3 months and have not had issues with scratching. It seems to be very solid, not just coated with black. "Does this faucet include the optional deckplate as well?" I am not 100% sure what a deckplate is, I'm guessing it's the metal piece that the faucet would sit in that extends out to the left and right of it. It is just the faucet, as pictured. Our contractor cut a hole for it in the new sink.